Twitter chats are one of my favorite things in the whole wide world of social media! They have made more connections for me than any other form of networking and have become one of the things I look forward to each week. 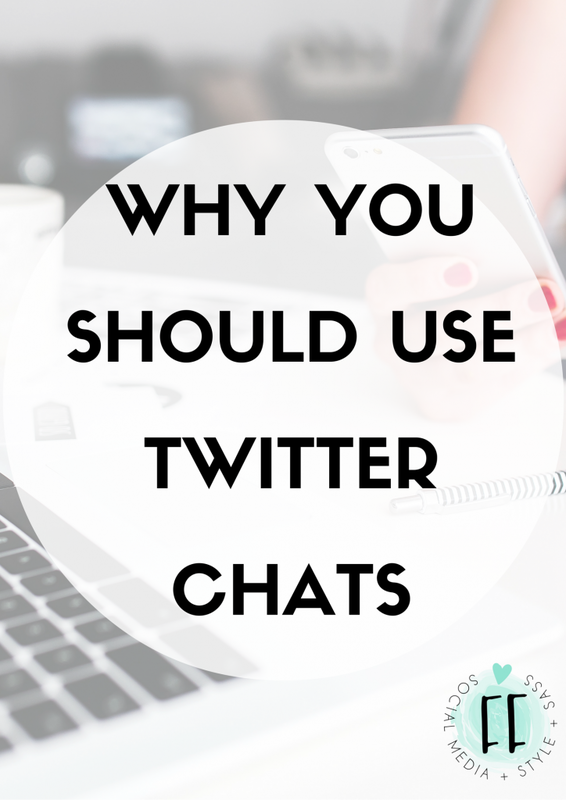 Twitter chats are generally hosted by one or two users, usually last an hour long, occur once a week and have an overarching topic (such as social media, fashion blogging). Each week, the chat's moderators will pick a subtopic (such as social media habits while traveling, how to land advertising deals for your fashion blog, etc.) and create a list of 5-7 questions for the day that will be discussed by those who "tune in" to the chat. The users can respond to questions using the designated hashtag for that chat, for example #SocialMediaChat. Typically, the question/answer session is operated in the same manner across all chats and is relatively easy to catch on to. Easy, right? Don't be discouraged even if you don't understand them at first--all users in the chats I participate in have been very welcoming and forgiving to newcomers. You can even sit and observe a chat your first time if you'd rather not jump right in. 1. Do a search on Twitter. Many chats have a designated @ handle (or profile) for the chat mods, and the chat will be explained in the bio section of the profile therefore generating in Twitter search results. Sometimes chats are a little harder to find, which is why I prefer doing Google searches. 2. Do a Google search. I would be looking for "marketing Twitter chats", "blogger Twitter chats", "best marketing Twitter chats" and other keywords like such. Some Twitter chats have their own websites sharing the upcoming topics and will lay out the time and rules of each chat. 3. Ask around. If you've already been using Twitter to network and get your professional endeavors discovered for a while, consider asking some of your friends or colleagues if they have any favorites. If they're dedicated to continuing education in their field, I'm positive they'll give you the name of at least one good fit! 1. Simply pull up Twitter, follow the accounts that host the chat and you're ready to go when the time comes! 2. At the beginning of a chat, hosts will request that participants introduce themselves--where they are from, what their occupation is, why they're participating, etc. Simply introduce yourself using the proper hashtag. 3. Actively begin watching the hashtag (and the hosts' accounts) for the stream of conversation that will begin shortly. 4. Jump in as soon as the first question is asked, and make it a point to engage with others--liking, responding and re-tweeting their tweets. The biggest gain that you'll get from a Twitter chat is networking, so be purposeful about this. 5. Once you engage with people for some time, begin following some of your favorite fellow participants--people whose views you feel you best connect with, people whose views challenge you (in a good way) and people who fascinate you with their work in your field. This is how you make Twitter connections and gather virtual business cards. As someone who is passionate about continuing my education in my field of expertise, it is very important that I do everything possible to make this happen, whether that's listening to podcasts, watching webinars or participating in networking events (both online and in person). Twitter chats can open up many doors--both to positive connections with fellow gurus, as well as personal growth in your own knowledge and skill. I love it for both reasons. Not only do I get to see the best of the best in my field, I get to talk with them--FOR FREE. I get to speak with people who have thousands and thousands of followers, tap into their vault of knowledge and hear their beliefs on my opinions with the click of a button. Then, if all goes well, I also get to make lasting connections with the people I spoke to. I can check out their blog and they'll check out mine. I can take a look at their latest marketing project and they'll give me advice on mine. The exposure you receive from participating in Twitter chats, as well as the tidbits you gain both make Twitter chats worth my time (in my opinion).